Desa Golf Apartment scheme is situated over 3 acres of residential land along Persiaran Bukit Jambul, which is opposite the Bukit Jambul Golf & Country Club and Penang Equatorial Hotel. 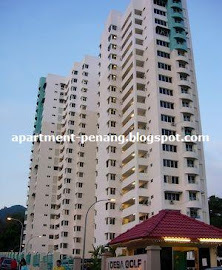 It is only a 5-minute drive to the Penang International Airport and Bayan Baru. Residents of the apartments can enjoy the convenience of a variety of public amenities in the vicinity. The residential scheme consists of a single 20-storey apartment block and has a total of 148 units. Each standard unit has a built-up of approximately 850 sq.ft. and is equipped with a balcony. The low density architectural concept is adopted to ensure optimum privacy. The neighbourhood apartment blocks of Desa Golf are Desa Bukit Jambul, Sri Bukit Jambul Apartment, Victoria Heights, Jambul Court and Jambul View. 24-hours security, covered car park, management office, community hall, reading room, common bathroom, swimming pool, gymnasium, sauna, tennis court, badminton court, children's playground, BBQ-pit, intercom system. Hi!Anyone know how much is the maintainant fee of Desa Golf? the fee is rm 150 per month. Hi, what is the approximate price for a unit at Desa Golf? Any review for this apartment? Available for rent a 3 bedroom unfurnished unit. If interested please contact owner at +65-97834680. Rent negotiable. Any nice unit for sale now? Price Range from 430k to 500k . Original and Renovated Unit Available. I am the owner and I have one original unit for sale. 850 sf, 420k negotiable, mid floor, now vacant. Will consider any reasonable offer. Please whatsapp me at +6597834680. Thank you.